Even if you are not planning to sell your home in the near future, a fresh and welcoming exterior is a wonderful thing to come home to each day. From front doors, house numbers and verandah furnishings to colour schemes, landscaping and basic repairs, this smorgasbord of ideas will hopefully inspire a few changes around your own home. It’s so easy to replace house numbers, and this one task can make a huge impact. Echo your house style in the numbers you choose – a clean sans serif font for a modern house, handpainted tiles for a cottage, aged copper for a rustic-style home, etc. A front door that ‘pops’ can be hugely cheering. A relatively small effort can make a huge difference to your home’s exterior. 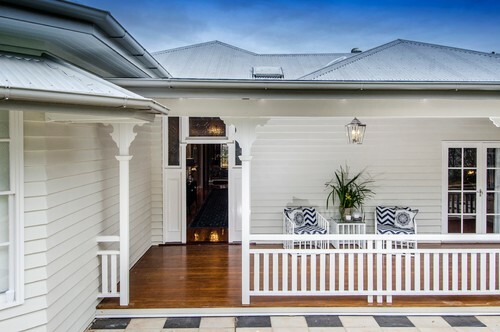 A pair of matching rocking chairs, Adirondack chairs or cosy, reclining armchairs are a must when you have a front verandah that is visible from the street. Try replacing tiny wall sconces with a big, statement-making pendant light, add recessed lighting beneath the eaves or install solar-powered lights along the entry path. Red has such vibrancy; a little goes a very long way. Try a bright red bench, planter or letterbox to add zing that can be seen from across the street. Built-in concrete planters, a low stone wall or new garden paths are all great ways to add structure to your front yard that will last for many years to come. 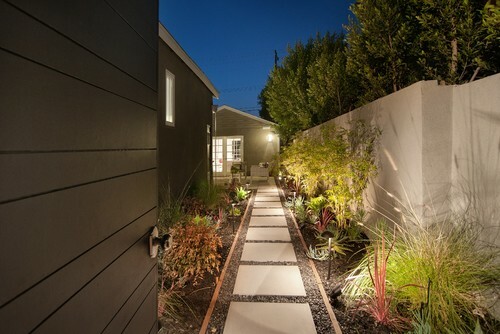 Camouflage an eyesore with attractive fencing, clear out weeds and lay out a neat path to the backyard. A low fence around a property not only adds a welcome boundary between a hectic street and a private space, but it also makes the front yard seem larger. Dig up part or all of your front lawn and plant perennials instead for a lush landscape that sets your house apart. Cement and pavers can split and crack over time. Repairing or replacing damaged areas can do wonders to freshen up your home’s street view. The garage takes up a lot of visual space, so it pays to make sure it looks its best. If your verandah floor has seen better days, renew it by stripping off old layers of paint and finish, and brushing on new paint or stain. Gorgeous hardware (plus a glossy paint job) can make even the plainest door look very classy. A really eye-catching front door can be just the thing to give a plain exterior a big dose of personality. Whether it’s sleek and modern with steel or a beautifully detailed traditional-style door, it can set the tone for the entire house. Let the plants and pots you choose reflect the style of your house for a cohesive look. Accent a modern home with succulents and spiky-leaf plants in simple round pots, or surround your residence with lush beds of flowers. Another way to accent the style of your home is by repeating the lines of the architecture in the paths and landscaping surrounding it. Wide, angular paths echo the geometry of this home. 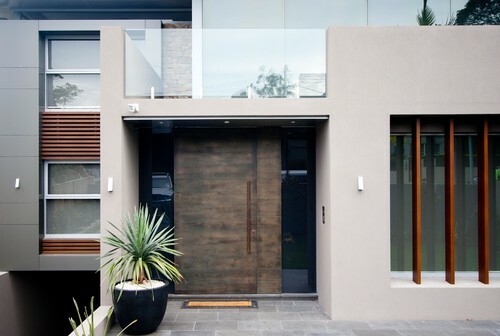 When you live in the inner city, it can be hard to personalise your home’s exterior. Work with what you have by adding neat window planter boxes, good lighting and clearly visible numbers.